Here are the active MLS listings of Homes for Sale in Ruby Ranch. Call Jim at 512.913.1557 if I can assist you. Neighborhood Location: The entrance to Ruby Ranch is about 2.5 miles west of the intersection of FM-967 and FM-1826 on the west side of Buda. The data in the table below provides a 8-year overview of the Ruby Ranch real estate market. Ruby Ranch Buda real estate market data from the Austin Board of Realtors, 1/1/2011 - 12/31/2018. The Ruby Ranch neighborhood meanders through the western side of Buda, TX. The community has one entrance on the south side of FM-967 at Ruby Ranch Rd. The homes in Ruby Ranch are all custom-built, and range in size from around 2,000 sq. ft. to over 5,500 sq. ft. Except for the original ranch house that was built in 1980, these homes were built mostly in the years 1996 through 2007. A few more homes were added since 2008. There are still some vacant lot properties available in the neighborhood for those who wish to have their own custom design built. In this neighborhood, the homes typically have 3-5 bedrooms, 2.5-4.5 baths and 2-4 garage spaces. You can find homes that back to Hill Country/greenbelt areas, to Onion Creek (normally dry), and with plenty of room to walk or run. 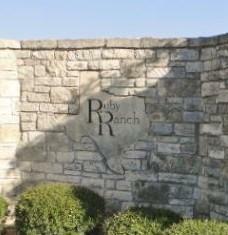 The lots in Ruby Ranch typically are 1-2.5 acres in size, but a number of them cover 3 to 11 acres. These homes have varying degrees of more modern updates and upgrades. Swimming pools are popular in Ruby Ranch. The Ruby Ranch community has an active Homeowner's Association. HOA fees are for common area maintenance. Homeowners are required to be members of the HOA, and to abide by the community deed restrictions. Taxes in Ruby Ranch are assessed primarily by Hays County and the Hays Consolidated ISD. Ruby Ranch Community: Shopping, Recreation, Etc. Though the Ruby Ranch neighborhood is in an "away-from-it-all" setting, there are a lot of shopping and eating venues nearby. These include those in Buda and Kyle (Super Wal-Mart, the very popular Cabela’s outdoor sports store, an HEB Plus grocery store, for example), and those in South Austin and Sunset Valley (Southpark Meadows, The Shops at Arbor Walk and Shady Hollow Village). Golfers can test their skills at two nearby clubs: the Grey Rock (Circle C Ranch) and the Plum Creek (Kyle) Golf Clubs. Those who want to venture outdoors can visit the municipal parks of the City of Buda, Austin's Circle C Metro Park and Mary Moore Searight Metro Park (both on W. Slaughter Ln.). It is not far from the neighborhood to other golf courses, shopping centers and parks ... and to Downtown Austin. Public school students who live in Ruby Ranch attend schools of the Hays Consolidated Independent School District. Potential Ruby Ranch home buyers should confirm the current school assignments and other school information with the Hays CISD.